In this guide we’ll walk step-by-step how to send HubSpot deal workflow text messages. 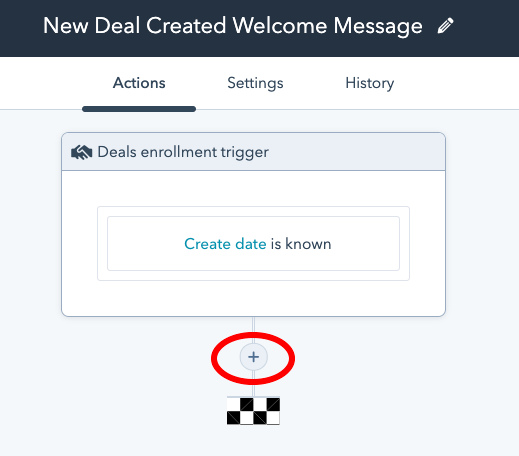 In our example, we will automatically trigger a text message whenever a contact is added to a deal. 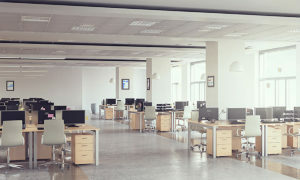 The contact will receive a personalized text message that includes their first name, as well as a description of their deal. Sakari SMS. By default, HubSpot does not have external SMS capabilities. In order to send HubSpot deal text messages, we need to add a third-party SMS service. We will link the two systems using HubSpot integration. Sakari SMS <> HubSpot integration. Linking HubSpot and Sakari is a simple process that takes just minutes and requires no code. Here’s the guide to setting up HubSpot text messaging integration. 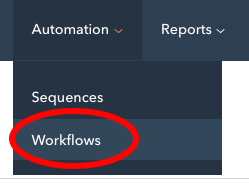 From the top menu, select Automation > Workflows. In the top right click the “Create Workflow” button. 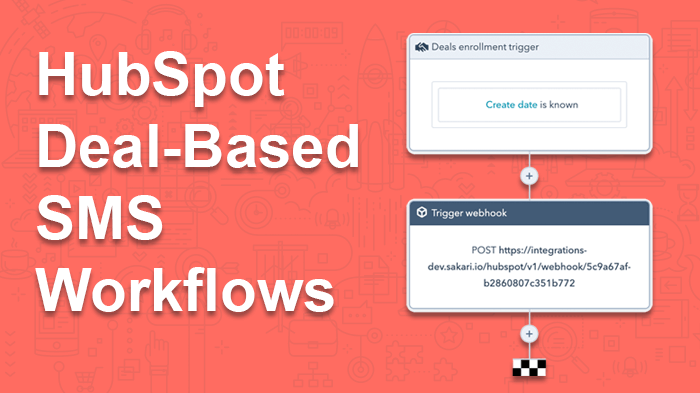 Select Automation > Workflows from the HubSpot top navigation menu. Now we’ll give our new workflow a name. In our example, we’re going to call it New Deal Created Welcome Message. 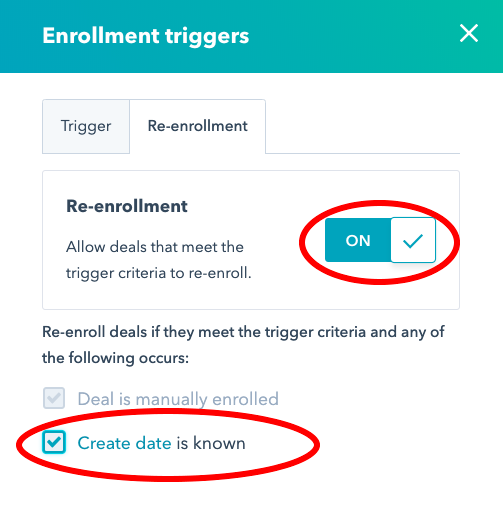 Click the orange “Set enrollment triggers” button to add a trigger. Now we’ll define the HubSpot workflow trigger. The trigger is what will cause the workflow to begin. In our example, we want a text message to be sent to a customer when a new deal is created. To add the trigger, select a filter type of Deal Properties and an attribute of Create Date, where the date is known. Select the Re-Enrollment tab. Re-enrollment will allow us to send another text message to a contact if they are associated with a new deal. 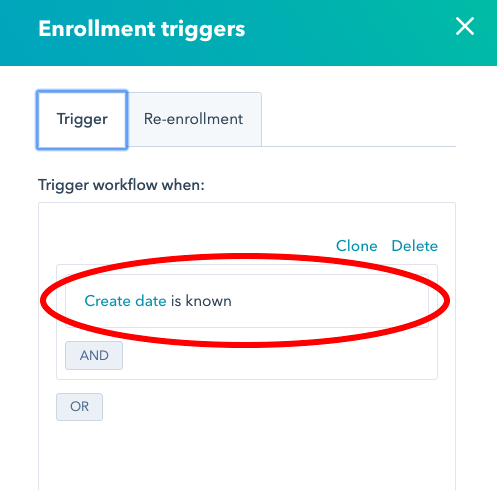 Toggle the re-enrollment trigger to on, and select the “Create date is known” checkbox item. Our deal-based SMS workflow trigger is complete. Now we need to add a resulting action. In our case, we want to send a text message. Click the “+” icon. We’re going to use a text messaging template when we send our message to customers. Using a template, each message can be personalized using just a single workflow. The message template will be linked to HubSpot using a webhook. 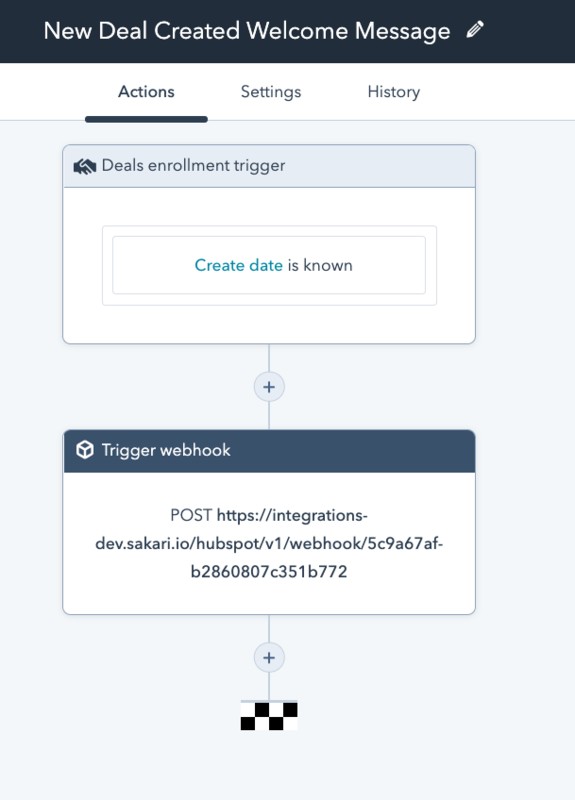 In our example, when a new deal is created, HubSpot will trigger a webhook to the URL we’ve identified. You can create your message template in Sakari and configure the web hook URL. This support article walks through how to create a SMS template with web hook URL. 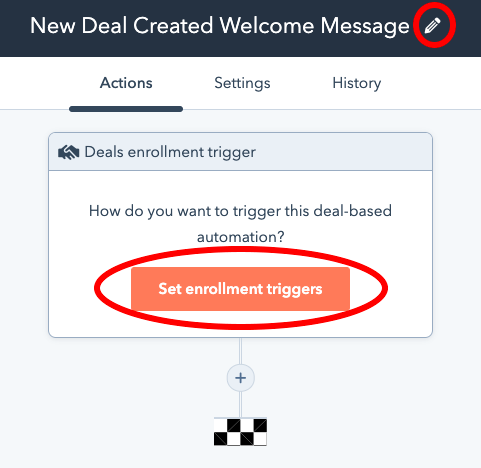 We’re going to use a webhook to trigger our deal-based SMS message. 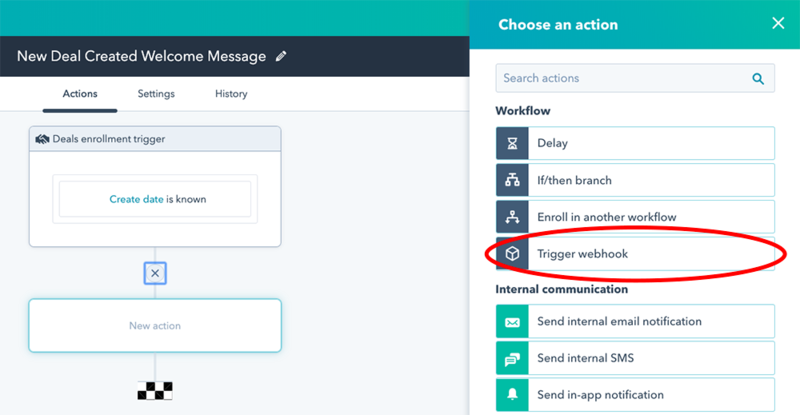 Select “Trigger webhook” from the workflow action options. 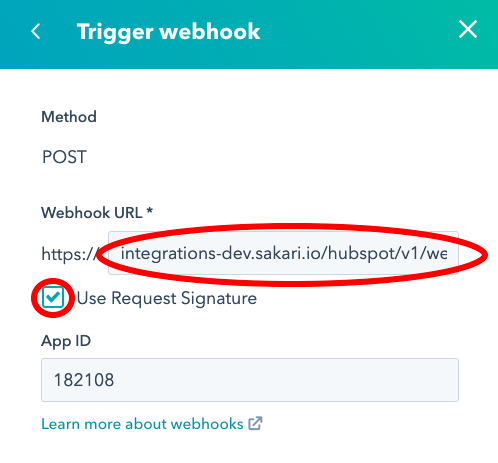 Paste your Sakari SMS template webhook URL in the field box. Check the Use Request Signature option, and enter the App ID of 182108. This is what your completed HubSpot deal SMS messaging workflow looks like. Click the Review button in the top right to turn your deal workflow on. Review the deal workflow summary, and click Turn On in the top right. Your HubSpot deal-based SMS workflow is complete. You can now test your workflow by adding or creating a new deal to a contact.